DxOMark measures ISO Sensitivity according to this definition and testing protocol. Although there is a wealth of information on the DxOMark site, the details of the data collection are unclear and the underlying data is not reported. One or more sets of images are taken using the 13-step noise and transmission target. Exposure at the focal plane is known by careful measurement and by the known optical densities of the noise and transmission target. Sensor saturation is measured by processing the central portion of the raw image data. 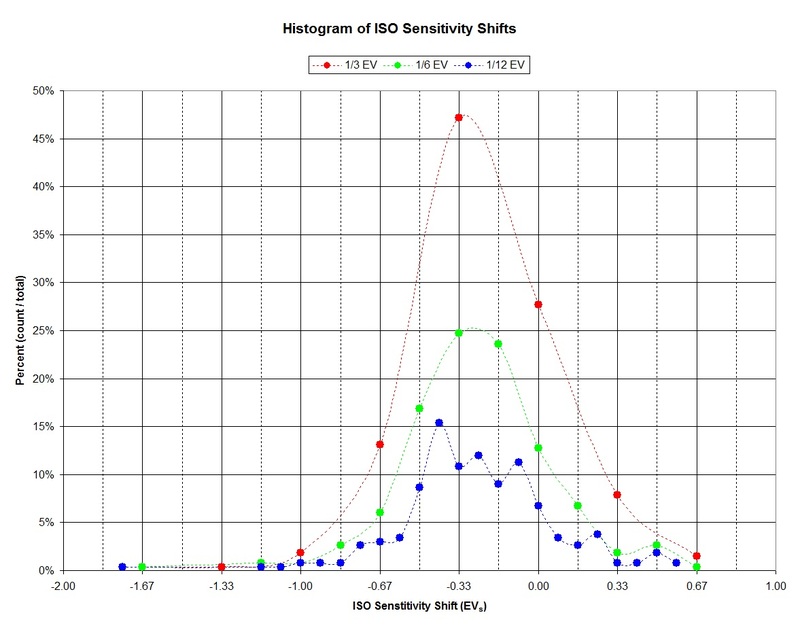 The ISO Standard 12232 definition that ISO Sensitivity is �where S is Sensitivity and H is luminance is used. We expect measured ISO to be linear with respect to the ISO setting on the camera (DxOMark calls this the Manufacturer ISO). I performed fits against the DxOMark data and confirmed this. The fits can be viewed on my Measured ISO Chart where you can see the amount of shift and compare multiple cameras. I call the difference between the ISO setting and the measured ISO the sensitivity shift. For example, a shift of -0.33 means that the camera sensor records light as if ISO were 1/3 stop lower than the ISO setting. I binned the differences to the nearest 1/3, 1/6, and 1/12 EV to analyze the trend. The majority of the cameras have a negative sensitivity shift; and that shift is strongly centered about -0.33 EV. This can complicate technical comparisons between different camera sensors. I suspect this has more to do with allowing for highlight headroom than some conspiracy to falsify ISO settings.